On October 3, Turkey fired some weapons at Syria.This was in response to Syria firing at Turkey and killing some Turkish citizens. Turkey and Syria are neighbors and used to be on friendly terms. However, this year, the government of Turkey has been upset at the government of Syria for its treatment of Syrian citizens. There has been fighting going on within Syria for about a year and a half. Syrians want their president, Bashar al-Assad, who has been the president of the country for over 10 years, to step down. Initially, people protested peacefully. However, the government’s troops used force to stop protests, and thousands of people were killed or put in jail. Rebel groups formed and started fighting back. The fighting spread to multiple cities, including Damascus (Syria’s capital) and Aleppo (Syria’s largest city). Turkey and many other countries have urged Assad to step down and stop the killing. In April this year, the Syrian government even signed a peace plan, which was presented by the United Nations. However, fighting has continued in the country. Thousands of people have been killed, and hundreds of thousands of people have fled from their homes to avoid the fighting. Many people have escaped to Turkey to find safety. It has been challenging for Turkey to support all these Syrians who have left their homes and have nowhere to go. Both Damascus and Aleppo are amongst the oldest continuously inhabited settlements in the world. An old marketplace, known as a souk, from the 17th century in Aleppo was recently destroyed due to a fire caused by fighting between the rebels and government troops. The war in the country has also damaged the ruins of the ancient city of Palmyra in Syria (see image). Palmyra was built in an oasis, and was used as a stopping place for people crossing the Syrian dessert. Palmyra flourished around 2,000 years ago as it became an important city on trade routes linking the east to the west. Turkey is also one of the oldest continually inhabited regions in the world. Two of the “Seven Wonders of the Ancient World” (the Mausoleum of Maussollos and the Temple of Artemis) were located in present-day Turkey. Turkey lives on two continents, Asia & Europe. Ankara is its capital city and Istanbul is its largest city. Istanbul is the only large city in the world that is a part of two continents. 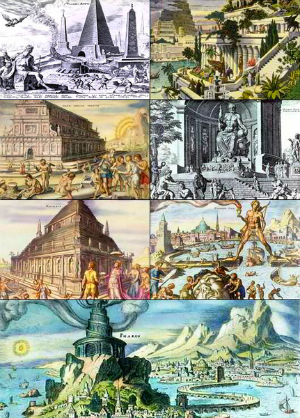 Nobody knows who created the original list of the “Seven Wonders of the World” (see image), but it was created around 2nd century BC. Out of the seven wonders, only one has survived – The Great Pyramid of Giza in Egypt. In fact, no one knows for sure what the other six actually looked like. All the drawings that we have today are from the imaginations of artists who lived a long time ago.